Solar wind flowing from this coronal hole should reach Earth on or about Dec. 27th. Credit: SDO/AIA. PENT-UP ENERGY: Sunspots AR1633 and AR1635 have 'beta-gamma' magnetic fields that harbor energy for M-class solar flares. Quiet since they appeared days ago, these sunspots nevertheless contain pent-up energy for significant eruptions. Solar flare alerts: text, voice. 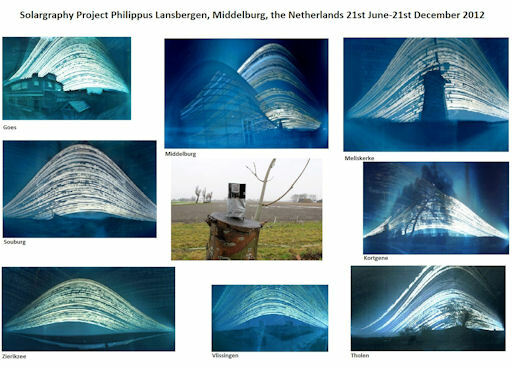 SUNLIGHT IN A BEER CAN: Last June, astronomers at Philippus Lansbergen Observatory invited members of the public to build their own solargraphs and record the motion of the sun across the sky. "On Dec. 21st, we received more than 50 solargraphs from people all over the Netherlands who collected sunlight in an empty beercan during the last 6 months," reports Jan Koeman. "Here are some results." A solargraph is a pinhole camera made from a soda or beer can lined with a piece of photographic paper. Using this simple device, the citizen scientists of the Netherlands recorded the daily track of the sun beginning on June 21st, the northern summer solstice, and ending two seasons later on Dec. 21st, the northern winter solstice. High tracks correspond to early summer, low tracks to late autumn. The only gaps are due to clouds and rain. The Netherlands have a reputation for rainy weather, but these solargraphs show the sun was out more often than not. With winter beginning in the northern hemisphere (and summer in the south), now is the time for a new batch of solargraphs to be deployed. Readers are encouraged to follow directions in the links below. 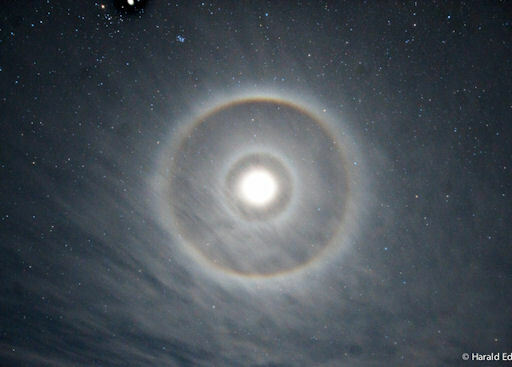 "Just after 7 PM local time I noticed a bright 22-degree halo around the moon," says Edens. "It was only when I started photographing that halo when I discovered a rare 9-degree halo inside the 22-degree halo." The inner 9-degree halo is caused by ice crystals in the shape of pyramids. "Apart from the 9-degree circular halo, an 18-degree and perhaps a 35-degree circular halo were also present at times," he adds. All of these "odd-radius" halos are caused by icy pyramids. The display quickly became even more varied. Edens saw at least a dozen different kinds of luminous rings and arcs, enumerated in his complete description of the event. "The display was highly transient," he notes. "Not only did the cirrus move fairly swiftly in the sky, but the halos - especially the odd-radius halos - appeared to come and go over the course of just a few minutes." But what a few minutes it was! On December 24, 2012 there were potentially hazardous asteroids.